Earlier this year Goldman Sachs had sent a report out to its high-net-worth clients indicating that it was the best time to own commodities in at least 15 years, if not decades. Economies around the world are growing in unison (good for commodity demand). The world is borrowing more money, which means more to spend (again, good for commodity demand). Inflation is on the rise (again, good for commodity demand). You may not love Goldman Sachs, but their research is definitely worth paying attention to. Then just a short time later, the notoriously secretive hedge fund legend Paul Tudor Jones had suddenly become rather chatty. His main message detailed a very bullish view on commodity prices. Jones’ view is based on a belief that the recent big tax cut is a mistake. His issue with the tax cut is timing, it coming nine years into an economic expansion. Jones believes the tax cut is going to be the spark that finally sets off the inflation fire. I see his point — there are a lot of inflationary forces at work here. This tax cut, on top of a decade of ultra-low interest rates, on top of years quantitative easing, on top of a spending bill. The bottom line for Jones is that nothing performs better in an inflationary environment than commodities. And in April another very smart investor reported that he thinks commodities are going to perform exceptionally well. At some point we may need to conclude that these proven investors are onto something. This time around the investor is DoubleLine Capital’s Jeffrey Gundlach. Gundlach doesn’t just think commodities are going to do pretty well from here; he thinks commodity prices are on the verge of exploding higher. Gundlach isn’t looking for a 30% rise; he expects commodities as a group to go up 100%, 200% or even 400%! That is a bold call. As to why (always the important part) Gundlach is so bullish on commodities, the investing heavyweight hits on a few factors that are similar to what we heard previously from Goldman and Jones. A continued weakening of the U.S. dollar. In addition to putting together the fundamental case behind rising commodity prices, Gundlach points to something else. That something else is history. What that means is that today commodity prices are historically cheap relative to large-cap stocks. Since 1970, commodities have only been this inexpensive relative to large-cap stocks twice before. After each of the prior instances, commodity prices staged furious rallies, outperforming the S&P 500 by more than 800%. History doesn’t necessarily have to repeat, but when you put the fundamental case alongside what has happened historically it is hard not to think commodities are poised to do well. That is good news for subscribers to Contract Income Alert because the portfolio holds bonds of several commodity producers with exposure to oil, natural gas and copper, primarily. We don’t need a big commodity rally for these bonds to do well, but it certainly isn’t going to hurt! I can’t believe it is true, but the financial crisis is now 10 years in the rearview mirror. It feels like last year. I remember exactly where I was when I heard that Bear Stearns was being bought out, when Lehman Bros. collapsed and when George Bush so eloquently stated, “If money isn’t loosened up, this sucker could go down”! Since those scary days we have had nearly a decade of uninterrupted economic growth and smooth sailing in the stock market. My point is that we need to be aware that sooner or later there will be a bump in the road. 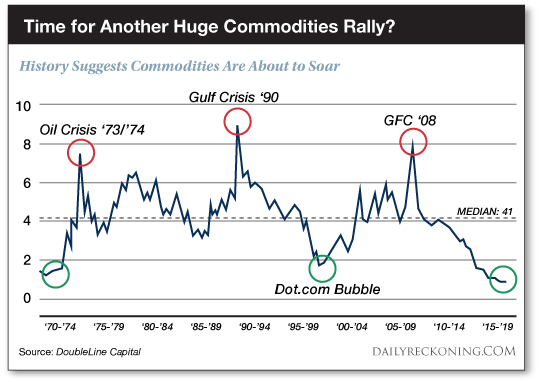 Jeff Gundlach’s historical chart provides a pretty compelling argument that a major commodity rally is close at hand. Unfortunately, if you look at what has happened historically after those commodity rallies, you will find dates that coincide with recessions. It happened in 1973, 1990 and of course 2008. The good news is that these past commodity rallies lasted anywhere from four–eight years. If this commodity rally is just starting, the next recession still could be a ways off yet. Between now and then rising commodity prices are going to fatten up the cash flows and improve the balance sheets of many of the companies whose bonds Contract Income Alert subscribers own. 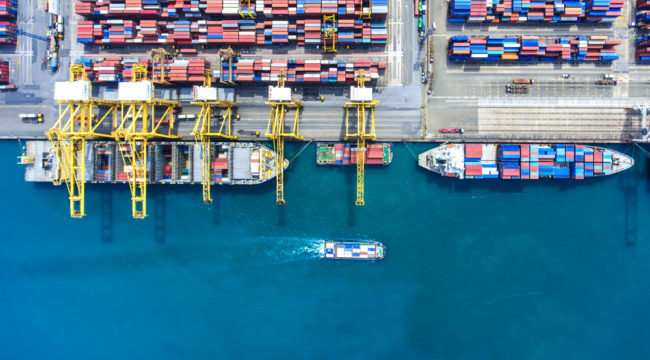 By the time the next recession rolls around, armed with a few more years of steady interest payments, we are going to be ready, willing and eager to take advantage of the discounted bond opportunities it produces. Of all the major commodities, the biggest story now is oil. I believe that this chart is very important. It details the number of days of oil demand that the U.S. has in storage relative to the five-year average. In other words, this tells us how long it will take us to consume all of the oil we currently have in storage. The blue line with the white circles represents 2018. You will notice that we are now right at the very bottom of the five-year average in terms of days of oil demand in storage. I can tell you that we haven’t been at the bottom of this range in a long time. If you look back to the line that depicts 2017, you will notice that as recently as September 2017 we were right at the top of the five-year average. 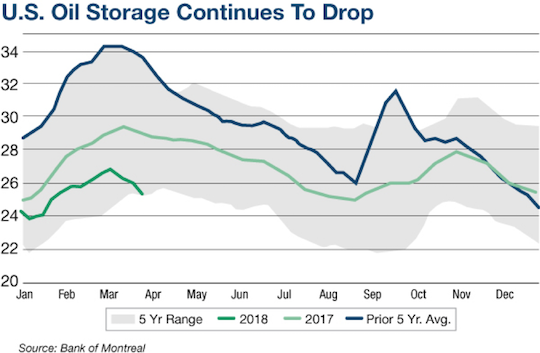 In just six months, we have gone from having an unusually high amount of oil in storage to now breaking through the bottom of the five-year average. Clearly there is a reason that the price of oil has gone up by more than 50% from last June. Folks, the oil market has tightened substantially. Furthermore, the market will continue to tighten until something happens to either curb oil demand or increase oil supply. Possible oil demand curbs would include higher oil prices or an economic slowdown/recession. For increases in supply, we need to keep our eye on the rate of growth in U.S. shale production and OPEC’s adherence to its production quotas. Say what you will about OPEC, but the reality is that the production cuts the cartel made (and adhered to) in late 2016 are the reason that oil prices have rebounded. For now, things look really bullish for oil prices in 2018.